Dir: Panos Cosmatos | Canada & USA | 2018 | 121mins. "He’s the only actor since Marlon Brando that’s actually done anything new with the art of acting; he’s successfully taken us away from an obsession with naturalism into a kind of presentation style of acting that I imagine was popular with the old troubadours." "I think Nicolas Cage is one of the few people in the history of acting that has really changed [the form]. I mean, he’s a true original—one of the greatest actors ever." "All I care about is the transformation." No actor divides opinion more than Nicholas Cage. Even though he's always had a cult following, for many years he was a bit of a joke; you weren't even sure if fans were laughing with him or at him. This is despite winning an Oscar in 1995 for Leaving Las Vegas and working with directors such as David Lynch (Wild at Heart; the filmmaker calls Cage 'the jazz musician of American acting'), Martin Scorsese (Bringing out the Dead), Werner Herzog (Bad Lieutenant: Port of Call New Orleans) and Francis Coppola (yes, his uncle). But for every great film, there's a dozen turkeys—the man's still a workaholic in his mid-50s, though mainly to pay off his debts, it seems. I'm still not sure he can actually act, but he certainly has a manic presence; and as someone in The Guardian wrote recently, they'd rather watch Cage's worst performance than any film with, say, the bland Ryan Gosling. I'm inclined to agree. Nevertheless, whilst Cage is powerless to control the numerous 'Cage rage' memes or the reddit forum onetruegod (with 117,000 members), he doesn't exactly help himself when he describes his acting techniques as 'Nouveau Shamanic', 'German Expressionist' and 'Western Kabuki', none of which anyone knows what he's talking about. Most people just call him crazy. A cult film used to take years to germinate. Not anymore—Mandy comes ready packaged as a cult classic. Charles Manson meets The Texas Chainsaw Massacre via Alejandro Jodorowsky and Dario Argento in this lurid, hallucinogenic doom metal psychedelic horror sci-fi revenge LSD trip of a movie. 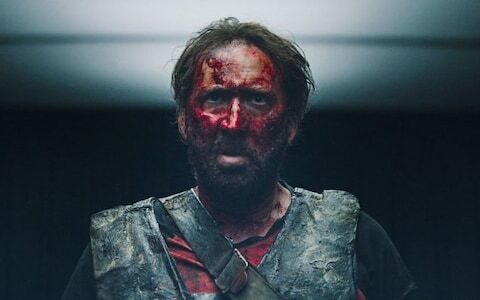 The first half has Nic Cage at his most laid back, playing Red, a lumberjack, living a peaceful, bucolic existence in a cabin in the woods with his girlfriend Mandy. (Sorry to be a party pooper but I would have enjoyed the entire movie if it was just the two of them pottering around, talking planets, watching movies and reading sci-fi novels...) Alas, of course, the tranquil bliss doesn't last. A hippie cult—with help from a demonic biker gang, the least scary of the bunch looking like Pinhead from Hellrasier—invade his home, murder his girlfriend. And Cage, naturally, goes crazy. And (spoiler alert) kills them all in variously imaginative ways. That's it. But what distinguishes the film, aside from its King Crimson opening song and the doom metal soundtrack from the Icelandic musician Jóhann Jóhannsson (who died earlier this year, aged 48), is the extraordinary visuals, the set pieces—and Cage's crazed performance.